It feels as if autumn has crept up on us in the blink of an eye, and as custom would have it, I've embraced it with open arms. As you may or may not know, I am something of a shoe hoarder. By that I mean I kind of, sort of leave a trail of footwear everywhere I go. There are shoes in my closet, shoes lining the walls of my bedroom, shoes in my living room, shoes under my desk at work. Needless to say, your girl loves shoes. I've decided to start doing a monthly "Shoe Crush" post where I will share with you the shoes I'm lusting for, shoes I've acquired, shoes I've been wearing, and any other shoe related bits and bobs that may have tickled my fancy over the past month. So without further ado, let's talk SHOES! 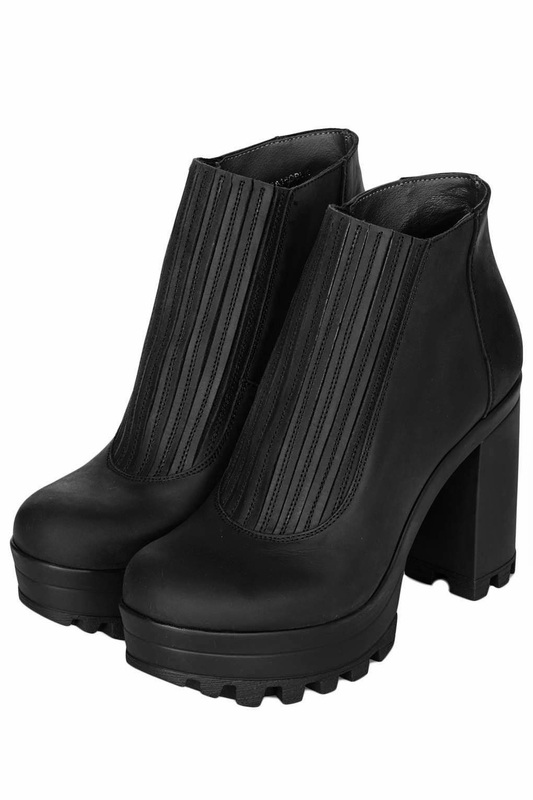 I first laid eyes on the Topshop "Happy" boot in early August and I must say, love at first sight truly does exist, at least in the realm of shoes it does. Visions of a velvet-clad Dee prancing around town in these babies plagued my mind on a daily basis until I finally caved. I made a beeline to Topshop, purchased them, wore them out of the store and the rest is history. They haven't been off of my feet for more than 12 hours since the moment they came into my possession. It probably goes without saying that the "Happy" boots have made my feet happy enough to dub them my star buy of the month! A boot like this is not typically my cup of tea but I decided it was time to step outside of my comfort zone. I feel like they are a breath of fresh air from the black leather platforms that I normally do. The leather is exceptionally soft which is one of the benefits of doing a more raw leather that has gone through less processing. Every pair will be a bit different at the end of the tanning process which makes them feel a bit more personal. They're the kind of boot that will look just as cool a year from now when I've put some miles on them because the distressing adds character. They're a reasonably priced alternative to a Rag & Bone boot. It is not custom for me to be dressed appropriately for our cold and icy Canadian winters, (Re: This post from last winter) but I think the "Judith" hits all the marks for fashion and functionality. I'm hoping to scoop these babies up before our first snowfall. The chunky sole is 100% rubber which is perfect for combatting icy weather. They're partially shearling lined as well, which offers that extra bit of warmth to prevent you from having to do the "OMG I can't feel my toes" dance that most of us Toronto girls have fallen victim to. 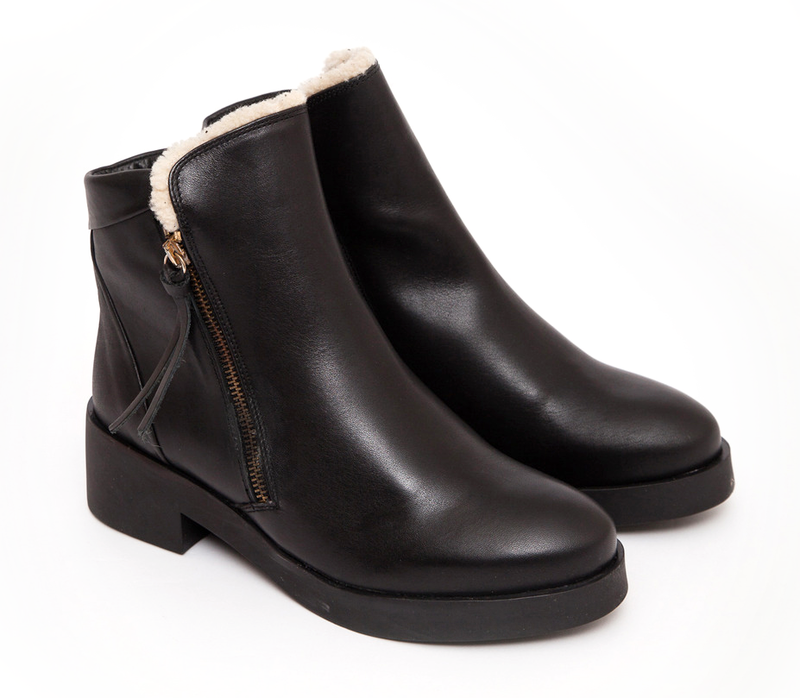 These are for the girl who wants comfy and cozy boots, but would never be caught dead in UGGs. They are definitely my pick for boots I'm DYING to have this month. Total #SHOECRUSH ! Italian Leather Custom Made Shoes at Azzuraa with the preference of design of your choice.